This double flared tunnel is made of iron wood. Iron wood in this case means that this is hard wood, hard to crack. Practical as it decreases changes of the tunnel breaking or cracking. The wood is mostly dark of color with brown and black stripes. Because this tunnel is made of organic material the piercing is vulnerable for outside influences and might slightly vary in size. Avoid direct contact with sunlight and (body) fluids to prevent swelling, cracking or other irregularities. 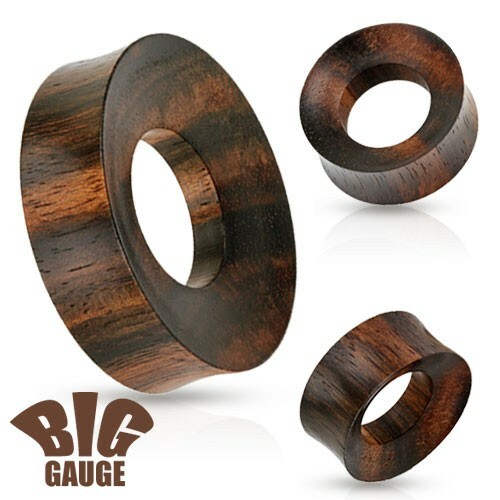 Because this tunnel is double flared it is best suited for fully healed earlobes.